An ultra sensitive pressure switch, Model PQ is designed for use on air or non-corrosive gas applications. 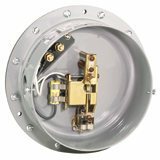 Large diaphragm operates special magnetic mercury switch. Operating point is adjustable over entire range. Unit is also available in weather-proof or explosion-proof housing. PQ-3-X1 0-0.1" w.c. 0-0.1" w.c. 1.0" w.c.
PQ-3-X2 0.1-6.0" w.c. 0.02" w.c. 10.0" w.c.
PQ-3-X2.6 0.1-6.0" w.c. 0.02" w.c. 10.0" w.c.
PQ-3-X3 1.0-30" w.c. 0.1-0.2" w.c. 60.0" w.c.
PQ-3-X4 0-0.1" w.c. (vac.) 0.01" w.c. 1.0" w.c.
PQ-3-X5 0.1-1.0" w.c. (vac.) 0.01-0.02" w.c. 10.0" w.c.
PQ-3-X6 1.0-30" w.c. (vac.) 0.1-0.2" w.c. 60.0" w.c.